2036 Origin Unknown. Director, Hasraf Dulull; Writers:, Hasraf Dulull, Gary Hall. It starts with a manned space shuttle making the first ever landing on Mars, which almost immediately gets destroyed by an ‘electrical disturbance.’ As a result of this the United Space Planetary Corporation (USPC) makes most of its staff redundant and relies on hyperlight communication networks and Artificial Intelligence (A.I.) systems for space missions in 2036. 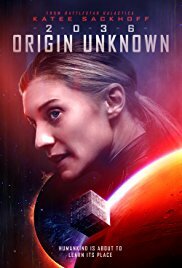 Mackenzie ‘Mack’ Wilson, played by Katee Sackhoff, does not have much faith in A.I. and believes in the power of human intelligence combined with creativity. So it is rather a mystery that she is the sole mission controller for an unmanned mission to Mars. Mack soon comes into conflict with the super advanced artificial intelligence supercomputer ARTi (voiced by Steven Cree), that is basically a globe on a boom arm that moves along a ceiling rail and has an arrangement of triangular lights glowing inside it. ARTi overrides her instructions for the landing of the Martian probe and is proved right in its analysis of the situation. However things soon go blobby when the Martian rover vehicle encounters a mysterious cube that is of unknown origin. The special effects are reasonably good but its main failure is the story. After a promising start it degenerates into a dull discussion between Mack and ARTi with some mystery or mysteries lurking in the background. The problem is director Hasraf ‘HaZ’ Dulull and co-writer Gary Hall rely too much on making a pound shop version of the great 2001: A Space Odyssey. This is a pointless exercise that needed a good rocket up its behind to make it exciting or at least remotely interesting.